A twist on a summer crowd pleaser, I used local red tomatoes and green zebra tomatoes, local mozzarella cheese, and grilled mushrooms glazed with balsamic vinegar and olive oil. After plating it, I added a sprig of basil and salt and pepper to make a hearty lunch salad. A meal in itself or festive appetizer, the two colors of tomatoes and mushrooms grilled with a balsamic glaze make this a pretty and tongue tingling dish. Mix oil and vinegar and pour over mushrooms in a small bowl. Marinate for about an hour. Grill mushrooms, turning frequently, until cooked or about 10 minutes. 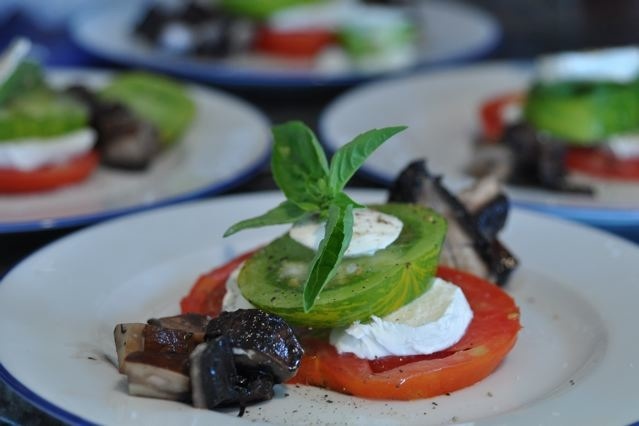 Let cool and cut into small pieces and serve alone, on top of salad greens or with a tomato and mozzarella salad as shown in the above photo.